Okay, business first! 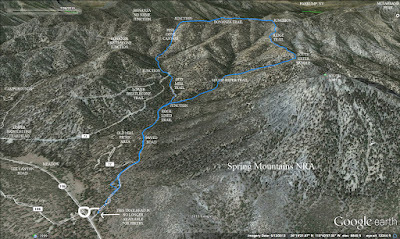 When eight club hikers turned their three cars onto Deer Creek Road in the Spring Mountains NRA this morning, there were NO construction signs! We traveled up the road and there were NO orange cones! Could they be finished? Yippee! So, now pleasure. We parked at the Robbers' Roost trailhead parking and began our hike by dropping down on the trail behind the large sign. This steep little trail ends at the junction of the old Deer Creek Road and Telephone Canyon Road, both dirt and gravel roads that are no longer used by motorized vehicles. We took a right turn and forked to the left waking up our muscles on a 0.90 mile downward stretch of Telephone Canyon Road. Just when we were about to get tired of the easy road, we arrived at the Trough Trail junction. 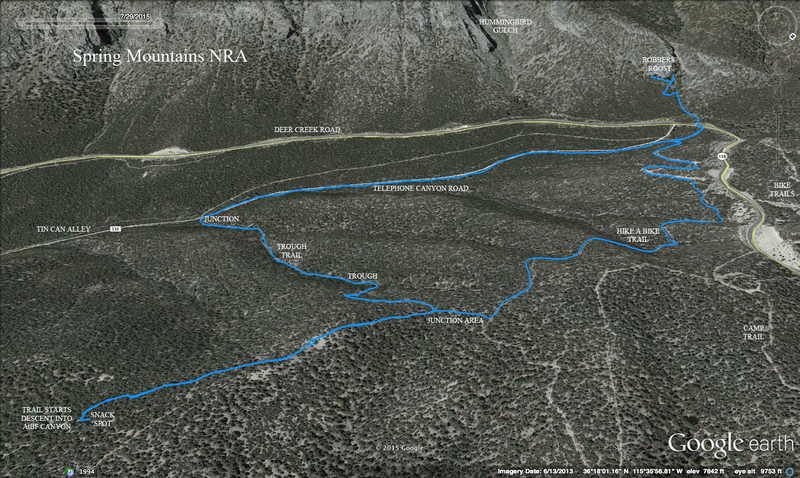 There is a cairn built on the right side of the road and the trail turns to the left. Our easy descent had ended and we turned to start a beautiful trail climb up through the forest. The Trough Trail is used by bikers so some of the trail is worn but still hikeable. It travels up the hillside swerving right and left up through a wash. We had to stop a couple of times to catch our breath and as we neared the spring-fed troughs, we saw four mule deer scatter from slaking their thirst. They were very healthy looking; beautiful animals. The trail continues from the troughs then begins switchbacking steeply to a high point of the hill. The high point trail junction seen in the photo above shows where we turned to the right to begin a small exploratory excursion out an unnamed trail. We followed the small trail about a third of a mile. When it passed another unknown junction, it became stronger and easier to follow. We stopped when we realized that it was beginning to lose precious elevation. We found a place to sit in the shade of the woods and had our break. 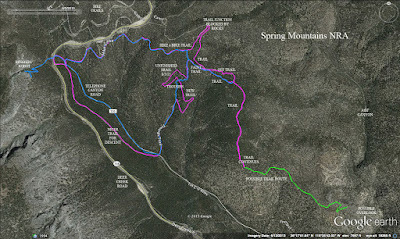 After studying the map of the area, it appears that this trail might continue down into the AtBF Canyon that we have yet to completely map out. The trail definitely warrants more exploration. But, today, we finished our break and continued on our planned route. We returned along the same small trail all the way back to the junction in a photo above. 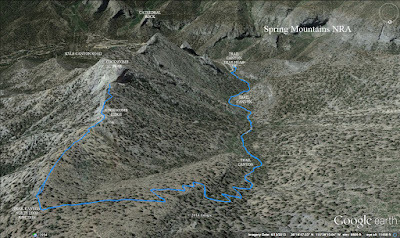 Views of Mummy Mountain and the escarpment containing Hummingbird Gulch and Robbers' Roost could be seen all along the ridge. Back at the junction, we turned right to continue on the Trough Trail that would soon tee into the Hike a Bike Trail. Here, we turned to our left. This junction was marked by a piece of "Caution" tape tied to a tree. Hmm. Must be for the bikers because, for hikers, this is another beautiful woodsy trail with nice views. This trail travels around on an easy down slope ending just below the new Deer Creek Road above. 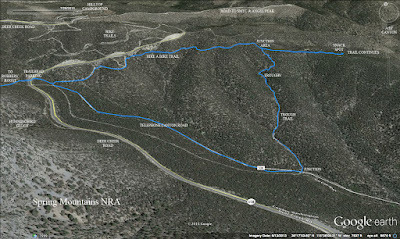 Eventually, the trail connects with the old Deer Creek Road and finishes the loop at the feeder trail that we came in on. We had a great group of hikers today that were ready for a lot of fun. And, the weather was great if not just a little warm. We climbed back up the feeder trail and that may have been the hardest part of the hike! Here, three hikers decided to call it a day. The remaining five hikers crossed the road and took a jaunt up the hillside to see Robbers' Roost. The sign explains this historic landmark as such: "Legends suggest that the Robbers' Roost cave area was used by horse thieves as a hideout around 1885, until cattle rustling became more profitable. The thieves may have robbed travelers on the old Mormon Road, a trail from Utah that went through Las Vegas Valley on its way to California." 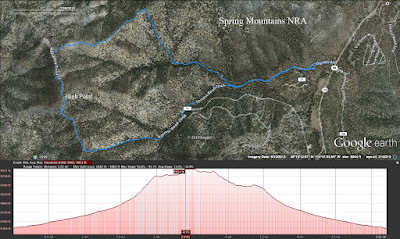 Although Google Earth calls the whole ridge that runs from Kyle Canyon to Lee Canyon Cockscomb Ridge, hikers refer the name to just the bottom of the ridge running from the Trail Canyon saddle to Kyle Canyon. And, of course, the remaining long section of that ridge is affectionately named Mummy Mountain. 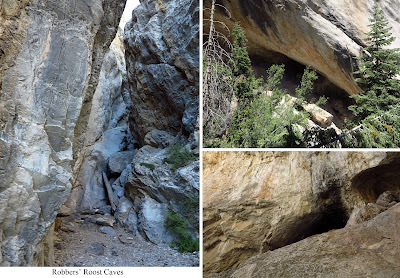 So, eleven hikers met up today for a hike up Trail Canyon and out along that ridge we call Cockscomb Ridge, a beautiful geologic formation of limestone. 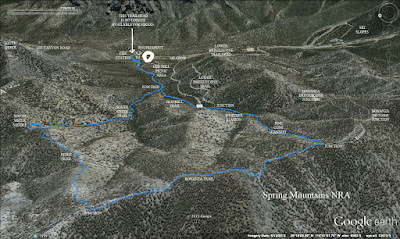 Since this hike was billed as a moderate hike, all eleven hikers gathered twice during the two mile climb up Trail Canyon. Once at the water tank and one more time at the beginning of the switchbacks. Participating were all levels of hiking abilities from moderate up to strenuous. But, under the direction of the hike coordinator, we refrained from running up the mountain. (Yeah. 'Cause otherwise we would have this baby churned out in half an hour!) Well, not really. We managed to regather at the saddle only an hour and eleven minutes from the trailhead. From there, we turned to the right and started up the trail that leads out Cockscomb Ridge. During the ridge portion of today's hike, we stayed together as best we could. The trail is good but there are a couple of places where the trail direction is questionable. Plus, there is a bit of exposure on the ridge and there is strength in numbers. Fletcher Canyon fell steeply down to our left. Upon reaching the base of the large fin-like limestone monolith called Cockscomb Peak, we stopped for our break. The views of Charleston Peak were enjoyed and then we started our trip back down. 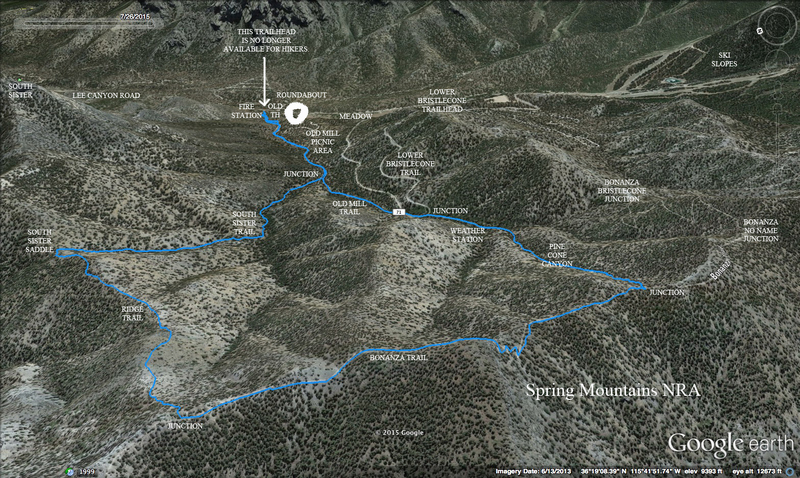 Once we got back to the Trail Canyon saddle, we dispersed to tackle the long Trail Canyon descent. In the end, we weren't too far separated. Nice hike. Once upon a time, not too long ago, there was a hikers' parking area at the bottom of the Old Mill Picnic Area where the very old pay phone resides. Last month, we were given information that the parking spaces at the phone were still fair game for hikers. Today, we arrived to see ominous looking signs all around these spaces ... but not in the spaces. So choosing to be quite confused, we parked there anyway and thought about our choice through the whole hike. There was no one around to ask. And, by the way, "only paying customers get to use the picnic area restrooms." 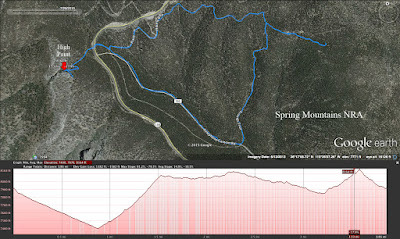 So, feeling a little like "chopped liver," we proceeded up the paved road to the Old Mill Trail, the trail that is lined with rocks and passes by the South Sister Trail junction. We were already climbing and, soon, nine club hikers junctioned with the Lower Bristlecone Trail. We turned right and came quickly to the Pine Cone Canyon trail junction. We turned right again. Geez! So, this is Pine Cone Canyon! Pine Cone Canyon is a formidable climb. 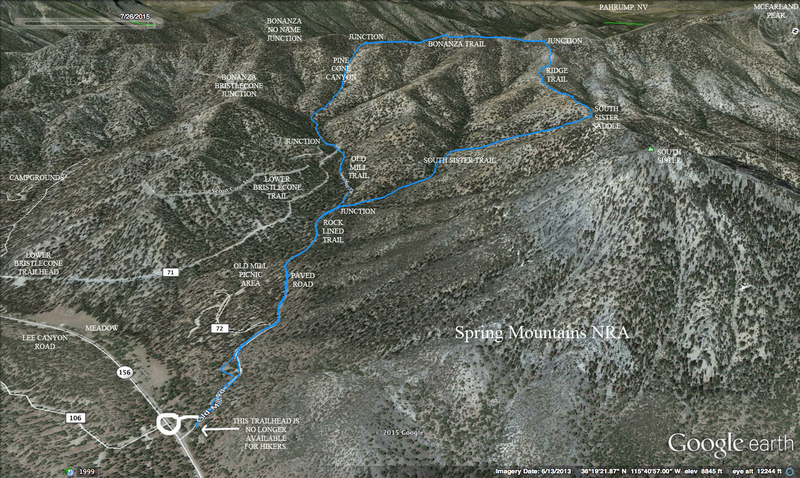 It is very steep and takes hikers directly up to the ridge of the Spring Mountain Divide ... or the Bonanza Trail. Asked to appear tired for the camera, the group gathers at the top of Pine Cone Canyon. Each hiker had to make this climb on their own terms. Although we had a strong group today, the hikers spread out and gained the ridge one by one. At the top, we rested just a little and took a photo. The hardest work of the day was done. 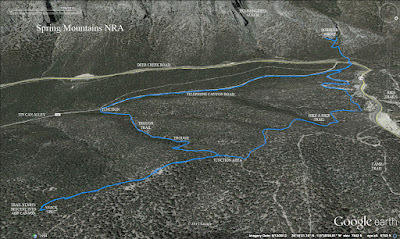 We turned to the right onto the Bonanza Trail and began hiking through one of the most beautiful parts of the trail. There were overlooks, old bristlecone trees, and gorgeous weather. South Sister watched us from our right side and Pahrump Overlook Peak watched from the left. 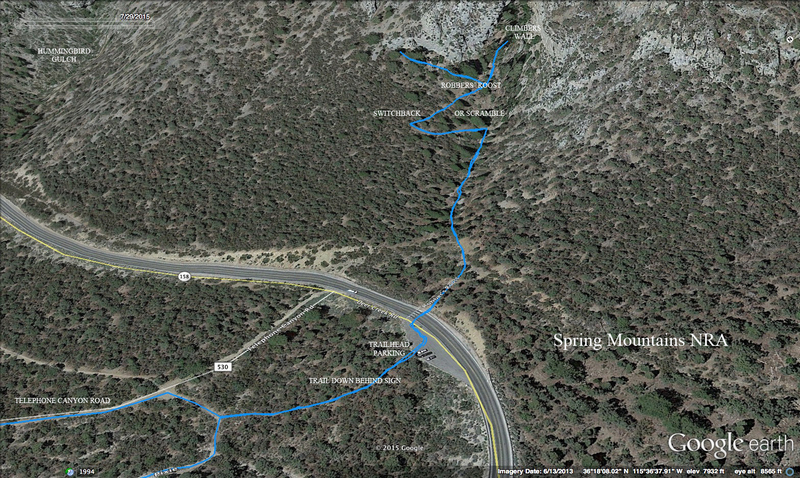 There was one climb on this section of trail that included a few small switchbacks. Views of Charleston Peak from here were very nice and resulted in the first photo of this entry. On the other side of this small peak, we dropped and went back up to our high point of the day (9951 feet). 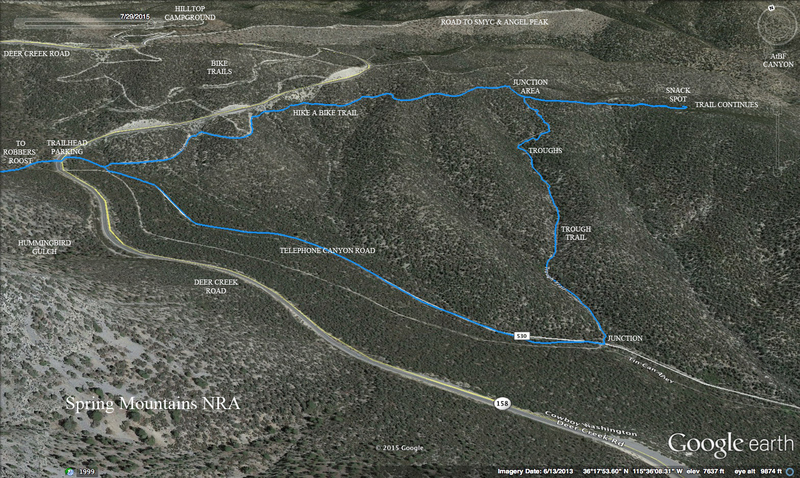 Then after hiking on the Bonanza Trail for approximately 0.75 mile, we arrived at the Ridge Trail junction. Two years ago, we began using this ridge trail to go from the Bonanza Trail to the South Sister Saddle. Somewhere along the way, a small rock was placed on the crook of a stumped tree on the left side of the trail here. The small trail turns to the right, climbs over the ridge hump then begins a steep descent. For the first half of the ridge descent, remember to stay to the right when the trail is temporarily lost. (For the second half of the ridge descent, default slightly to the left.) Between the first and second halves of the ridge, there is a great place to sit for a snack break as we did. There is a lot of evidence of wild horses living on this ridge. We were not lucky enough to see any wildlife today. After our break, we descended the second half of the Ridge Trail and ended at the South Sister Saddle. We did not need a break here, so when everyone regathered, we began our descent down South Sister Trail to the right. 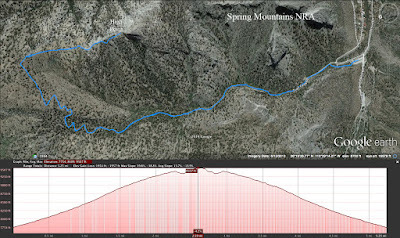 South Sister Trail starts off of the saddle very steeply but eventually enjoys a comfortable descent down through the woods next to a wash. Before you junction with the Old Mill Trail, the terrain flattens out in an area with a spring and an old homestead foundation. 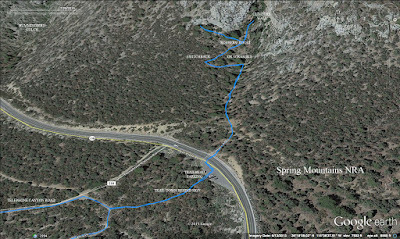 The route then joins the Old Mill Trail down to the paved road and continues through the picnic area. We were relieved to find our cars where we put them and with no tickets on the windshield. Further research needs to be done as far as parking allowances go in this area. At any rate, we all had a great hike!